2013 was another productive year for Mindful Design Consulting. We are very grateful for all our clients and friends. It is a great pleasure meeting new entrepreneurs, helping them to achieve and to brand their dreams, being a part of their new adventure. 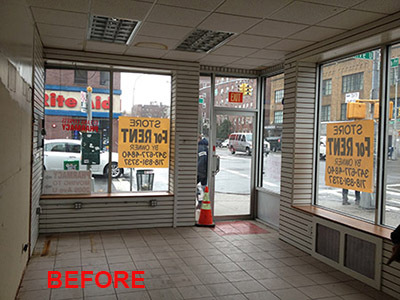 As usual, today we share our before and after photos of selected projects. You can find this and other interesting design ideas on our Blog. In our Green News corner, we are introducing the new color of the year 2014 which is yearly picked by the PANTONE institute. Take a look how you can decorate with this elegant color. If you missed our November newsletter you can find it HERE. There you can take a quick 5 question test to see if your company is branded enough. Just a quick reminder, don't drive and text during this holiday season! Funkiberry is Full of Fun! 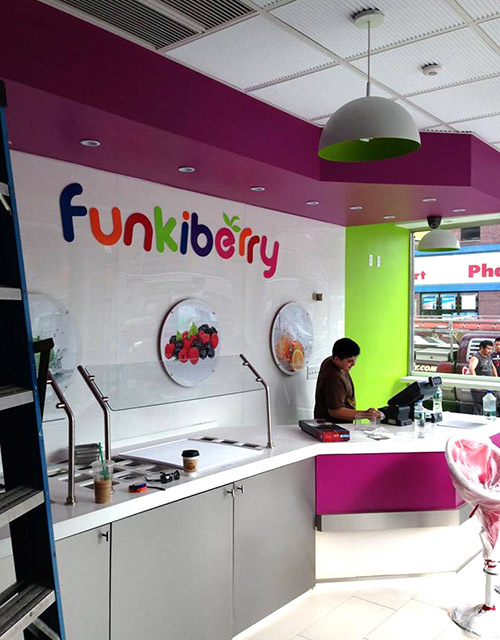 Within last year, Funkiberry Frozen Yogurt Shop has opened three locations in New York. 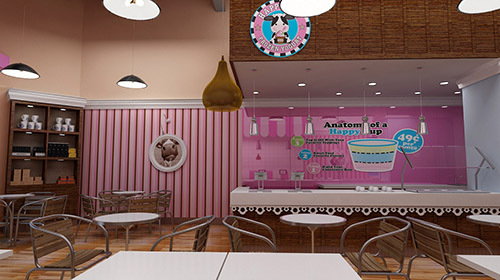 We've created a fun and inviting brand for this new frozen yogurt store. 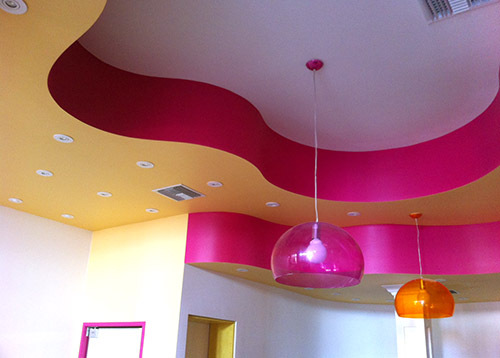 Bright and playful colors were picked carefully to add emphasis to the invigorating store design. White slick acrylic panels provide a beautiful backdrop for all the colors and lights. 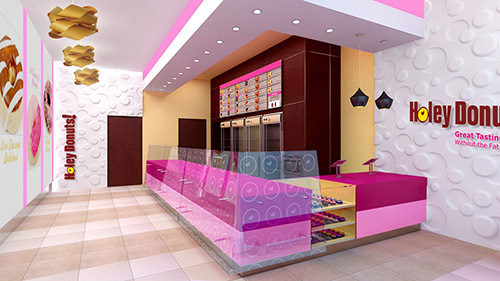 Above is a 3D rendering of a store design proposal for our Funkiberry Frozen Yogurt store. 3D representation is a part of the usual design process. See other services we provide HERE. 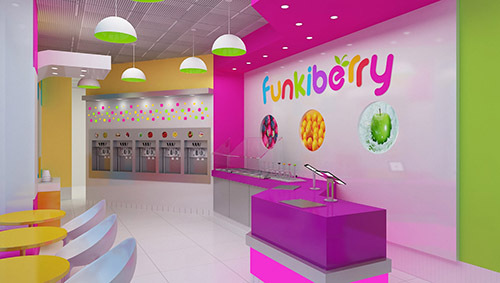 Above is a second view of the 3D proposal for Funkiberry Frozen Yogurt store. Bright colors and hip lighting are just one example of the distinct store brand. Above you can see Funkiberry Frozen Yogurt store during construction. A few details have changed as we proceeded to construction, but the overall playful feel was still captured within the store interior. 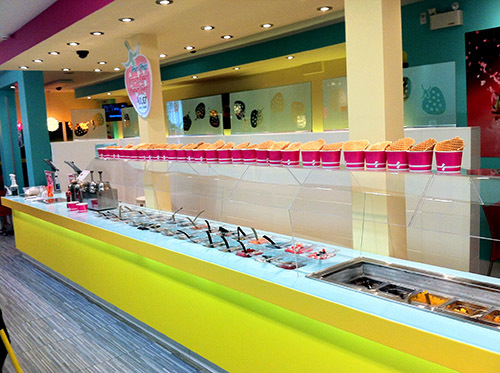 The first location of Funkiberry Frozen Yogurt store was previously a Pharmacy. This space was not very well kept and needed plenty of work. 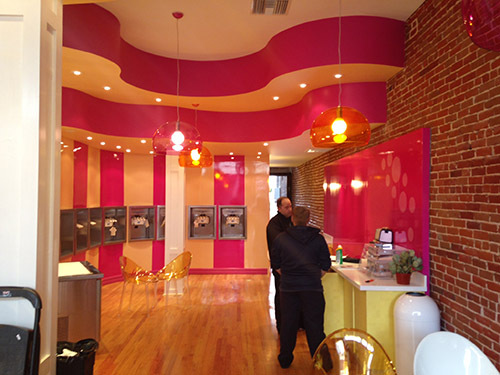 The two partners owners of Funkiberry frozen yogurt did a great job picking run down locations and upgrading the city's neighborhoods with this friendly and bright store. You can find Funkiberry's 1st store at the cross section of Ocean and A Avenues in Brooklyn, NY. Two other locations are 1917 Kings Hwy, Brooklyn, NY and 33 3rd Ave, New York (still under construction). 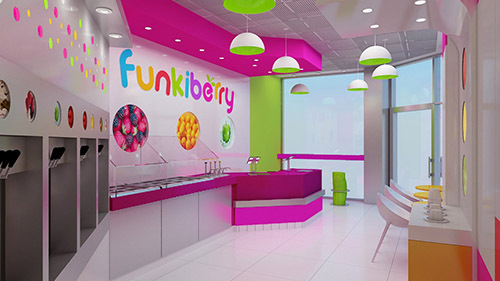 You can also purchase a franchise from Funkiberry now. Happy Cow Frozen Yogurt owners had an exciting year: getting married, buying their house and opening up a new brand of a frozen yogurt, all in one year! Although it's a lot to handle, they are doing an exceptional job! 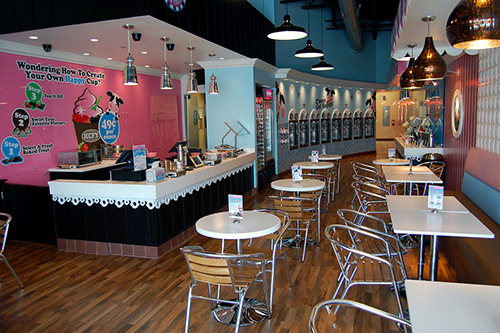 Happy Cow Frozen Yogurt is all about a sweet, comfortable home feeling. It was a combination of a playful Victorian with a touch of industrial style. The colors we picked were warm and feminine, which contributed to the store brand. Above and below are the 3D animations of designs proposed by Mindful Design Consulting interior designer. The owners loved the store branding and interior design ideas from the start. Pendants that look like cow bells were a great complement to the overall interior design of the store. Quirky pictures of cows were framed in white frames and highlighted with spot lights. 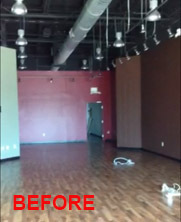 We preserved the existing wood flooring of the space. 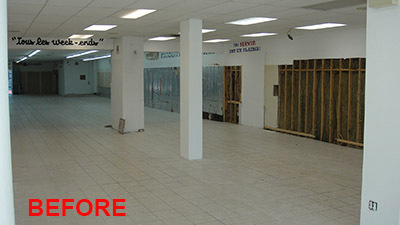 Below are some images of the store during and after construction. What an amazing transformation! 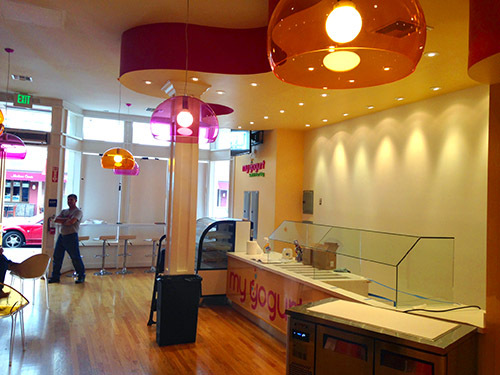 Below is the Happy Cow Yogurt Store space before the renovation. You can Find Happy Cow Frozen Yogurt store at the Shoppes at New Tampa plaza at 1646 Bruce B. Downs Blvd, Wesley Chapel, FL. 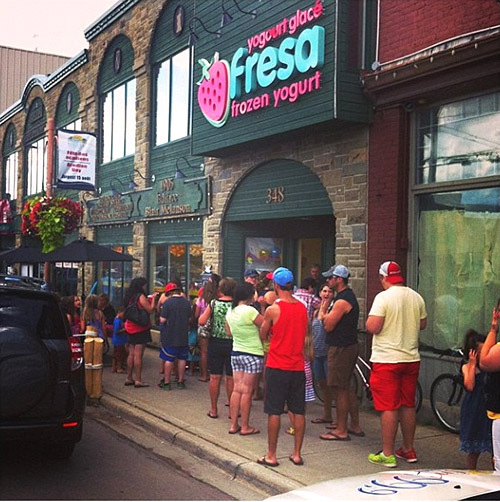 Fresa is another festive and playful yogurt shop we designed last year in Canada. 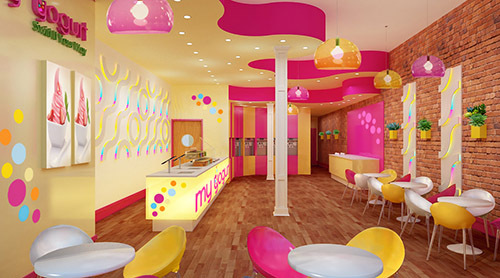 Behind this traditional facade, you will find a colorful and exciting yogurt store full of fun and yummy desserts! Fresa had an awkward and challenging space with different sizes and shape columns right at the center. Space planning produced great results creating this unique store. All the toppings and cash registers were placed at the center of the space instead of being by a wall, as traditionally done. Playful store colors and clever lighting really made the store cheerful and bright. 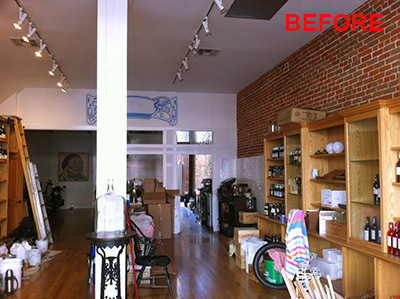 Above and below are photos of the finished store. Our interior designer did a fantastic job! As you can see from the pictures below, the store had columns going through the center of the space. It's amazing to see what a difference can be made with the use of different colors and materials within such a boring white space. Lighting also plays a key role in any interior design. 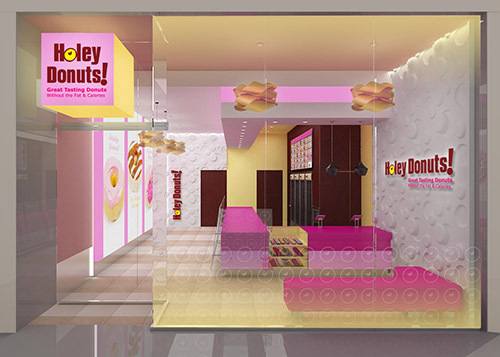 Holey Donuts is an online store successfully selling fat free and reduced fat donuts for over five years now. The owner of the store came to us looking for ideas for his first location in New York. First, we cleaned up and updated the original logo of the store. 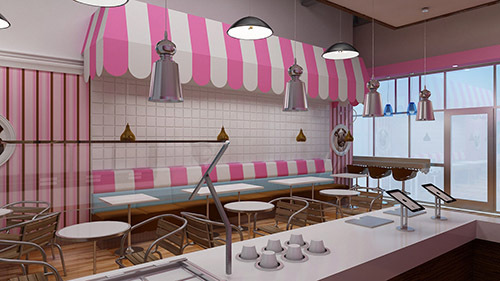 The colors and style were chosen based on the main clientele of the donut store - young professional women who are also health conscious. Below are 3D model views of the proposed designs Mindful Design consulting created. LZF lights look very dreamy and inviting inside of this high-end donut store. We are hoping this store will be built soon. San Diego High-End Desserts Place! Finally, San Diego is getting a new frozen yogurt and desserts shop built on 5th street, Gaslamp District. "My Yogurt," designed by Mindful Design Consulting, will be selling high-end desserts from a local French bakery, some alcohol (beer and champagne), and of course frozen yogurt. The owners are very healthy-minded and will make sure to provide healthy choices of the dessert. LED panels will be changing colors inviting passing by tourists and locals who like to hang out downtown after work. I cannot wait to go and try some desserts at My Yogurt! Some of the main design elements to note: the curved ceiling looks fantastic! Drastic elevation change due to the structural beams created this playful element. Bright sweet colors, pink and yellow, make this place stand out from the rest! 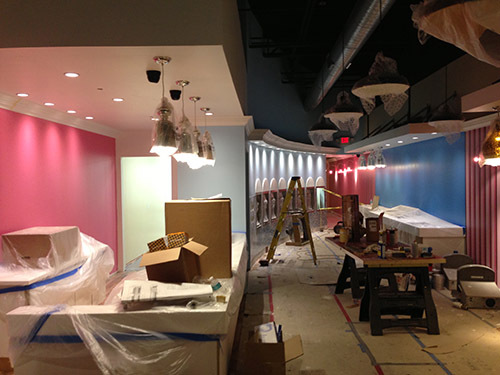 Above and below are pictures of the store during construction. The store is planned to be open next Friday, soft opening December 27th. Unfortunately the LED panels came in broken and had to be reordered again. You may not see them if you go within the next 2-3 weeks. My Yogurt Frozen Yogurt and Desserts came into the place of a wine store. We decided to keep the original brick wall and the original columns that go together with the exterior of the building. The wood floor is also original. Wood taken from the new kitchen area was put into the floor of the corridor next to the bathroom. 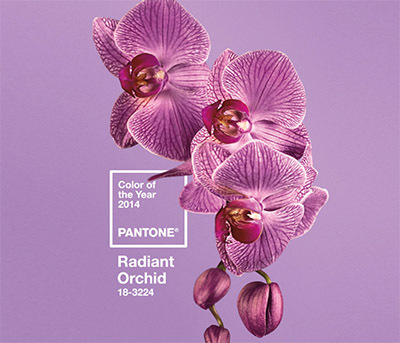 The Pantone Institute has announced its 2014 color of the year – Radiant Orchid Color. “An invitation to innovation, Radiant Orchid encourages expanded creativity and originality, which is increasingly valued in today’s society.” Read more on how to decorate with the new color of the year 2013 HERE.